I have been in a bit of a rut with my sourdough baking lately. It is just so easy to stick to the same routine every week but I thought I would try something different this time using a recipe that is not too complicated for me. I had a look at some of the recipes on Gina's Home Joys blog as I had used a couple of her recipes before with success and finally settled for a variation of her Oatmeal Honey Sourdough Bread. This makes a soft bread and if you are interested in another similar recipe check out her Soft Sourdough Bread. It doesn't have the thick crust (which I didn't want). The dough was a bit hard to handle so I used my dough scraper to get it into the bread tins after putting it to bed to rise during the night in an Esky complete with hot water bottle. You can see Celia from Fig Jam and Lime Cordial using a dough scraper in this blog post Sourdough Cooking Class 2018: Step by Step Instructions. I replaced the honey in the recipe with Rice Malt Syrup just to see how if that would work and the bread tastes just fine. By the way if you clicked on that last link which took you to the I Quit Sugar website please read this message from Sarah Wilson, the founder. Sarah has decided to close I Quit Sugar so if you want to download any information or recipes from there it might be a good idea to do that as soon as possible as I read in the comments that the webpage will eventually be taken down. As I always forget what recipes I have tried I will write down this recipe for future reference. Mix all ingredients except salt for 2-3 minutes and allow the dough to rest for about 20 minutes. Then add salt and knead the dough for approximately five minutes. The dough was fairly sticky so I just kneaded it as best I could without wearing too much of the ingredients. Then place it in an oiled bowl until nearly doubled in size. I put mine in an Esky as I mentioned before and because the nights are very cool I added a hot water bottle. In the morning I divided the dough into two pieces and had trouble shaping it into loaves so just put the dough scraper underneath it and lifted it into the loaf tins lined with baking paper. Then for the second rise I used the method Chris taught us at our Simple Living Toowoomba workshop. You can read all about that in her post 'The' Sourdough Tutorial. I turned the oven onto the lowest temperature and put a dish with boiling water on a bottom shelf. At this stage I brushed egg whites on top of the dough and sprinkled some oats on before putting the two tins into the oven for an hour till they had risen. The oven was turned off after ten minutes by the way. Chris' instructions are to then take the risen dough out and turn the oven on to 210C (410F) and put the loaves back in the oven after five minutes but I was too lazy to do that so just left them in the oven. They were ready in about 35 minutes. When cold the loaves were sliced and put in the freezer to use for toasted sandwiches. Firstly though I had to do a taste test with butter and vegemite. Yum! I am sure my readers in the Northern Hemisphere would be wondering how anyone could like vegemite. Ha ha! Gina from Home Joys has some other great recipes on her blog so do check them out. Her husband was diagnosed with Stage 4 brain cancer a year ago so I am sure they would appreciate your prayers for their family. I hope all the mothers reading this had a wonderful Mothers Day on Sunday. My son (after being reminded about the big day coming up) bought me a pot of chrysanthemums and the flowers are absolutely huge. 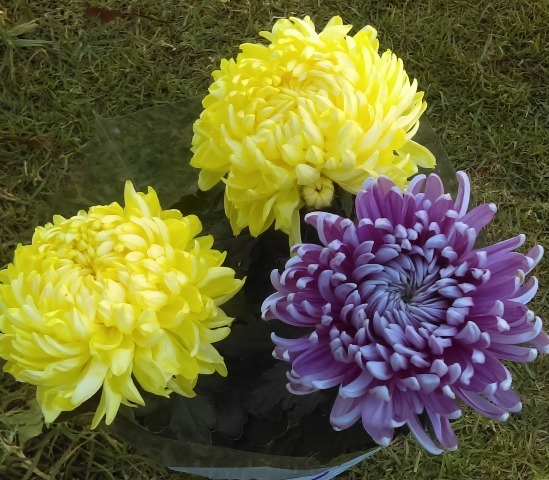 So now I won't have to buy any chrysanthemums for a few years as I have four different types to keep me happy. My daughter sent me some doTerra essential oils which always come in handy and we enjoyed a phone call. So all in all it was a lovely day. Looks like a nice soft loaf Chel. Taste tests are essential - my go to is butte and vegemite as well, you just can't beat it. Thanks for the link to a new to me site - look forward to checking it out. Laura, it is a nice soft bread especially good for those who have trouble eating the normal sourdough crust. It is nice for a change. Thanks Nil. I think you meant bread not beard. LOL! I prefer Vegemite as I never took to Marmite. That bread looks fantastic! My bread baking adventures were some time ago, maybe I will take it up again.